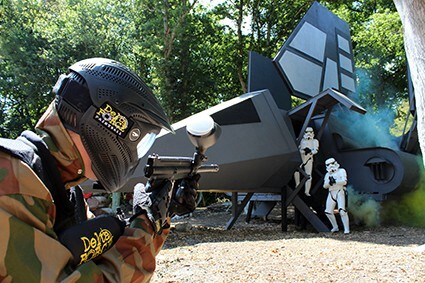 The Delta Force Paintball London Centres can are all easily accessible from the M25 motorway, covering Watford, Orpington, Essex, Surrey and Berkshire. Paintball fanatics living in the city have so much choice! Our North West London and Watford Paintball centres are both located in the beautiful countryside of Hertfordshire and offer guests a fantastic selection of Hollywood-style game zones to explore! 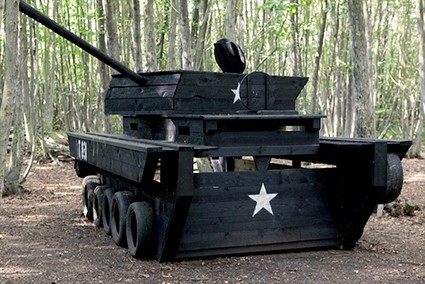 The popular Hemel Hempstead Paintball Centre features the notorious game zone, ‘Black Hawk Down’, which has a crashed black hawk replica helicopter for players to hide in! For those of you that are further east, then take a look at our paintball London Centres in Essex and Orpington. Our East London Paintball Centre is based in Upminster and the only one of our centres that can be reached using the London Underground and within walking distance of Upminster District Line tube station. Our South East London paintball centre in Orpington is one of our most modern, with a fantastic array of paintball game zones, including the much-loved D-Day Landing scenario. If you live in West London, our Berkshire and West London paintball centres are your most local. Both feature a fantastic selection of game zones and first-class facilities at basecamp, including open and covered picnic areas with lots of seating and secure lockers for storing your valuables (for a small fee).